Anywhoo...What totally changed and upgraded my attitude on makeup is a combination of a lot of things. I started to watch a lot of makeup tutorials on Youtube, looking into indie makeup, and buying my first non sponge applicator eyeshadow brush Avon's Eye Liner brush. Consequently, perpetuating my fascination for loud and bright eyeshadow looks and all sorts of brushes. I researched brushes cause I didn't want to spend more than $10 on something that would be easy for me to lose but I didn't want something totally useless. 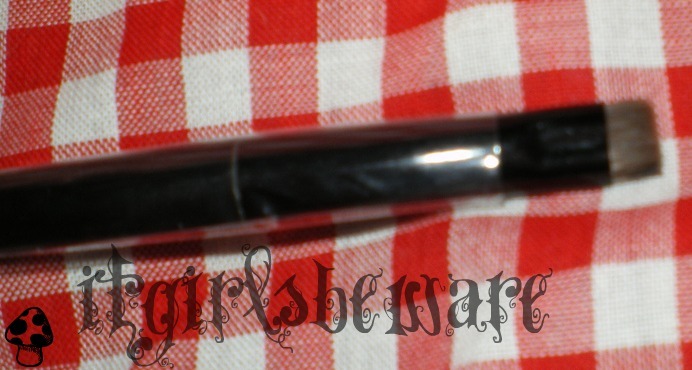 So when I saw this amazing eyeliner brush for $2.99 I kindly placed my order and awaited it's arrival the Thursday before payday *yippy skippy* and have loved it ever since. Well, the one in the following photos is actually the replacement one because I had lost it several months ago...gave up on finding it and bought another. in its protective case...I had to blur it out cause the flash was a touch too bright. This time I'm going to keep it in there. Short stiff *tehe* with the plastic slip on thing that I decided to hold onto. The other one that I had for a year didn't seem to have any problem with shedding/losing shape after using and washing once or twice a week. All in all, this brush totally changed my look from eh-to woot woot. And so far I've paid $6 for two of them. Ordering is pretty easy..You can go to their website and search for a representative near you. You can usually find someone you know or you can check out what Avon has to offer..and I have never met my dear Avon Lady personally, my boyfriend's coworkers friend, if you wanna check it out risk free for yourself.